Oyster Disease Research Professor Gene Burreson and VIMS graduate student Kristina Hill study oyster diseases with an experiment in the York River. Burreson is one of VIMS' most prolific oyster researchers. © Ryan Carnegie. A global analysis of the scientific literature shows that 4 of the 20 most prolific authors of oyster-related research articles are professors at the Virginia Institute of Marine Science. As an institution, VIMS ranks eighth in the world in provision of oyster-related publications during the last three decades. The study, by researchers at the Chinese Academy of Sciences’ Institute of Oceanology, analyzed bibliographic and keyword information from Thomson Reuters’ Science Citation Index-Expanded© to identify authorship, priority research areas, and emerging research trends among 11,493 oyster-related publications from 1991 to 2014. The study appeared in the June 2015 issue of Aquaculture International. Citing the global importance of oysters in improving water quality through filtration, building reefs that sustain shallow-water ecosystems, and supporting an international aquaculture industry, the authors write that the aim of their paper is to provide “a comprehensive portrait of global oyster research” in order to help “establish directions for further” studies. 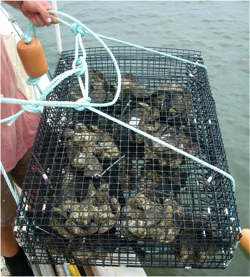 VIMS’ top-tier oyster researchers are Drs. Eugene Burreson and Roger Mann (tied in 9th place with 64 oyster-related publications each); Dr. Stan Allen (tied in 12th place with 57 publications); and Dr. Kimberly Reece (tied in 15th place with 54 publications). To put these numbers in perspective; the analysis also found that of the 23,414 authors worldwide who had authored or co-authored at least one oyster publication since 1991, 93.1% contributed less than 5 papers. VIMS Dean and Director John Wells says the results “clearly show the leading role our researchers play in generating the basic and applied knowledge needed to restore Chesapeake Bay’s wild oysters, and to continue the sustainable growth of our region’s rapidly expanding oyster farms.” Results of VIMS’ latest “Shellfish Aquaculture Situation and Outlook Report" show that Virginia's growers sold 39.8 million cultured oysters in 2014, an increase of 39% from the previous year and enough to place the Commonwealth atop East Coast oyster production. Wells adds that VIMS’ global leadership in oyster research is likely even more pronounced than the recent study suggests, as the analysis fails to include the many oyster publications and monitoring reports produced at VIMS during its first five decades from 1940 to 1990. Because the Thomson Reuters’ database does not include abstracts of publications issued before 1991 (thus precluding keyword analyses), the study authors chose to omit the more than 2,000 oyster publications produced between1900-90. The world’s most prolific author of oyster-related research publications is Dr. Pierre Boudry of the French Research Institute for Exploitation of the Sea (Ifremer) with 106 publications. Ifremer is also ranked as the world’s most productive institution of oyster research, reflecting France’s long history of oyster farming and current position as the top producer and consumer of oysters in Europe. Ranked second in the top-tier of oyster researchers with 104 publications is Dr. Ximing Guo of Rutgers University’s Haskin Shellfish Research Laboratory, who served as an adjunct professor at VIMS between 1999-2008 and is a close colleague of Dr. Stan Allen. Allen and Guo jointly hold the patent for the tetraploid oyster that is at the heart of Virginia’s recent surge in oyster aquaculture. VIMS and Rutgers are the only two institutions worldwide with 4 researchers among the top 20 most-prolific authors of oyster-related publications. The study’s analysis of the keywords used by authors to describe their work provides a more nuanced look at oyster research and again puts VIMS scientists at the forefront of trends and frontiers in oyster research. The study analyzed keywords both globally and by country for the 10 most-productive nations in oyster research: the U.S., France, China, Japan, Spain, Australia, UK, Canada, South Korea, and Brazil. The foci of oyster research at VIMS also parallel and help shape oyster research on the global scale. Of the top 100 most-used keywords describing oyster research worldwide, Crassostrea virginica (3rd ranked with use in 447 research articles), aquaculture (10th /189 uses), Vibrio parahaemolyticus (15th/138 uses), polymerase chain reaction (17th/129 uses), Perkinsus marinus (18th/125 uses), V. vulnificus (26th /103 uses), Eastern oyster (33rd/90 uses), biomarkers (37th/83 uses), parasite (39th/83 uses), Chesapeake Bay (52nd/71 uses), polycyclic aromatic hydrocarbons (53rd/69 uses), and C. ariakensis (60th/63 uses) stand out as exemplars of oyster research at VIMS.